Acapulco is a stunning coastal resort, with the most popular hotels offering uninterrupted views across the Pacific Ocean. The Mexican city of Acapulco has become a major tourist destination and accommodation here is plentiful, with over 30,000 guest rooms on offer at hotels throughout the area. Accommodation rates in Acapulco vary according to the season and lodging is at its most sought after and therefore expensive during the high season, between mid-December until just after Easter. 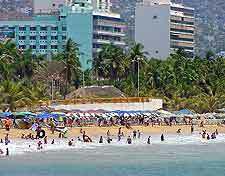 Crowds flock to Acapulco during the Semana Santa celebrations at the beginning of April, when hotels are likely to become fully booked. Towards the end of April, the Tianguis Turistico tourist trade fair is also a crowd puller and affects the availability of accommodation, which must always be booked well ahead. 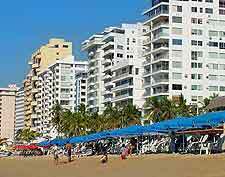 Between July and August, the school summer holidays, Acapulco once again becomes particularly busy and hotel prices rise slightly. Outside of the main high seasons you will be able to find more favourable hotel rates, particularly when holidaying in Acapulco for several weeks. 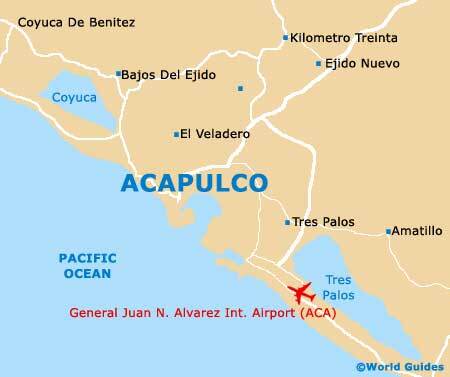 Much of the budget accommodation in Acapulco is centred around the Zócalo area and in particular, along La Quebrada. In particular, a good selection of sensibly priced hotels can be found close to the Plaza La Quebrada, enjoying pleasant cooling breezes. A high concentration of mid-range accommodation comes in the form of high-rise hotels and apartments along La Costera, although during the high season, lodging can become expensive. 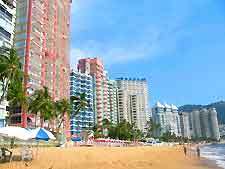 Better deals are usually available in the older areas of Acapulco and around the Centro Internacional para Convivencia Infanti (CICI) amusement park, along the Avenida Costera Miguel Alemán. Also look out for accommodation around Acapulco's Playa Icacos, which tends to offer good value for money and often includes kitchen areas. At the top end of the Acapulco accommodation scale, luxury hotels and resorts are plentiful in supply and a number of recent additions are to be found within the relatively new Acapulco Diamante area, on the eastern side of the Puerto Marqués. The high-rise hotel zone around La Costera also features a good supply of bayfront accommodation in Acapulco, starting on the eastern side of the Parque Papagayo. Look out for discounted off-season hotel rates, which can be surprisingly reasonable for double occupancies, offering a high standard of accommodation and often the use of a swimming pool.